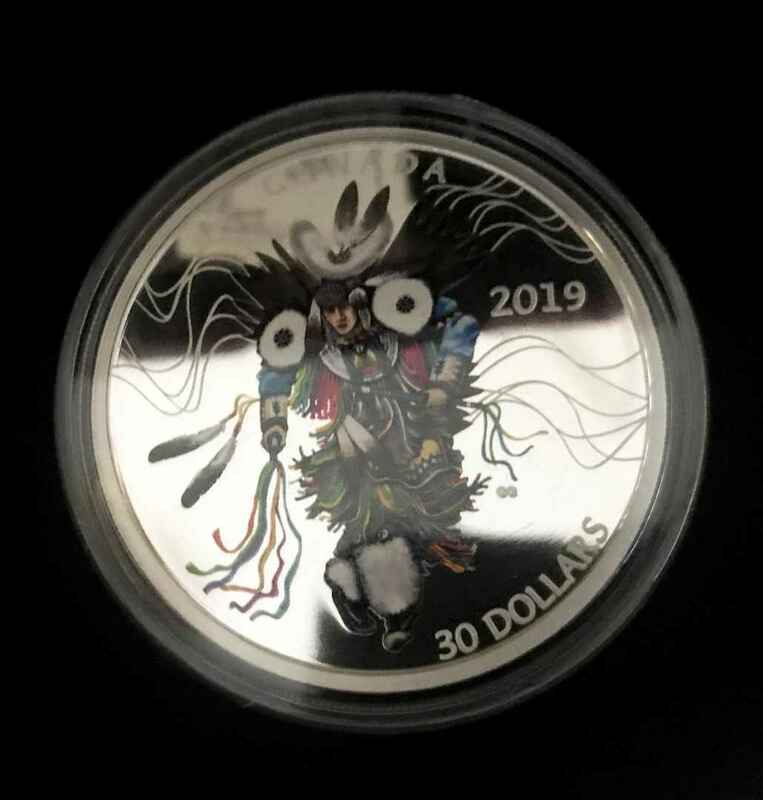 Akwesasne artist Garrison Garrow is well aware his work on the tail side of a Royal Canadian Mint collector coin does not come without consideration, and maybe controversy. His portrait is, after all, on Canadian money. “That was definitely on my mind, for sure,” said Garrow. Susanna Blunt’s Queen Elizabeth II portrait is featured on the “heads” side of the coin. Garrow is a policy analyst working out of Indigenous and Northern Affairs Canada (INAC), and sees his work as an artist no different than the work he does as a civil servant: he works for Onkwehón:we people. The pure silver, two-ounce coin featuring a colourful and vibrant fancy dancer is not anything to be used in a vending machine or tollbooth. With just 3,500 printed, the $189.95 price tag is well beyond the $30 value on the coin. With collector coins, the Mint’s goal is to create more than just money. In creating art via coin, Reeves said, the Mint can also promote those in Canada creating unique and vibrant work. “It’s a great way also to feature the work of Canadian artists, and, in this case, an Indigenous artist: Garrison Garrow,” he said. Garrow started the design process in 2014, and, after the original project fell through, was contacted in November last year with the idea of creating the collector coin in colour. The Mint regularly features history, culture, heritage, and other aspects of the state on its coins, including several Indigenous-themed collector and circulation coins. The one-once pure silver, gold-plated Tecumseh coin was the most recent collector coin the Mint produced. It sells for $129.95. For Garrow, the fancy dance design is something he sees as a perfect fusion of traditional and modern Onkwehón:we realities. “Fancy dancing is a new form of powwow dancing,” he said. “It was born from the idea of powwows. You had traditional dances and then at a certain point in time, they started to modify it a bit, and that became the fancy dance. In the flip of a coin (literally), a reconciliation occurs in Garrow’s fancy dance coin, as the Onkwehón:we and Canadian worlds appear alternately with each turn. The fancy dance is the perfect way to achieve this reconciliation for the artist. “It’s a fusion of traditional and the world we live in now,” said Garrow. “That’s also why I think it fits in well with reconciliation because it is about bringing those two together in a way that is our way to do it. “The foundation of the dance is ours, our traditional way of doing things, and we are allowed to bring in the elements that we want from our culture and from western culture and bring it together,” he said.